Immigration Minister Scott Morrison is trying to push through what is perhaps the most draconian assault on refugee law we've ever witnessed. It's difficult to overstate just how wide sweeping and dangerous the implications of Minister Morrison's proposed Migration and Maritime Powers Legislation Amendment Bill will be if it passes through the Senate. See below for some of the key changes proposed in this bill – including changes that would see Australia ignore its obligations under international treaties that prevent people from being sent back to places where they risk being tortured. The good news is we still have some time to stop it, but not much. The bill will likely be put to a vote in the Senate next week. 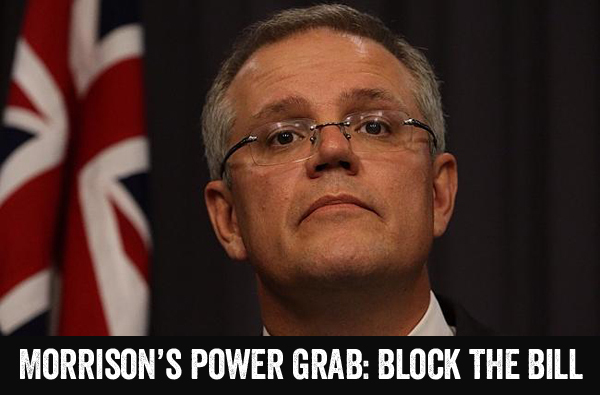 Minister Morrison has been lobbying hard for months, he wants to see his bill pushed through so he will have the power to play God with people's lives. Let's help make sure he doesn't get his way. Write to your senator today and ask them to block this draconian bill! If you receive a reply, be sure to let us know by dropping us a line at [email protected], so we can keep track of where the senators stand and hold them accountable to their word. TPVs don't allow for family reunion rights, meaning families can be separated for years. In the past, this has led to an increase of women and children trying to reach Australia by sea. The so-called "deterrence value" of TPVs is highly questionable. In the two years following their initial introduction in 1999, there was actually an increase in boat arrivals. There is also a new type of visa being proposed by the Government – Safe Haven Enterprise Visas (SHEVs) – which seem good at first glance. Details of how the visas will work haven't yet been released, but there are reports they will allow people to work and stay in Australia for up to five years, provided they live in "designated regional areas". This could give a much needed boost to regional towns struggling to attract workers. Furthermore, SHEVS provide a pathway to permanent residency (this is different from permanent protection), by allowing refugees on SHEVs to eventually apply for a student or working visa. Sounds pretty good right? But here's the catch: refugees (people who are found to be owed permanent protection) will only be eligible to apply for permanent residency if they can manage to support themselves for three and a half of the five years, without any income assistance. There are significant questions around just how many people SHEVs would help. Applying for a student or work visas would be very difficult for many refugees due to the high application fees and the level of English language skills required, not to mention the hurdles to clear along the process. Even Morrison himself has said to those wishing to apply for such a visa, "good luck to them". If passed, this bill will remove most references to the UN Refugee Convention from the Migration Act – in short, we might as well be removing Australia's signature from the Convention altogether. The bill will redefine the term "refugee" under Australian law to one that is out of step with, and narrower than, the definition currently accepted under international law. The "redefined" interpretation of a refugee under this Bill could mean people will need to prove they face a real chance of persecution in all areas of the country they're fleeing. For example: a Hazara refugee, who escaped the Taliban in a particular province of Afghanistan, will need to show there is no where in Afghanistan they can safely be returned to, or they will risk deportation to a different part of the country. "Would you expect the inspirational Nobel Peace Prize winner Malala Yousafzai, who fights for girls' right to education in the face of Taliban opposition, to "modify her behaviour" and simply retreat indoors?" It's worth noting that the Parliamentary Committee on Human Rights (mainly comprised of Coalition Senators) found that the bill is incompatible with our obligations under international treaties and "is likely to significantly limit a number of human rights protected by international law" – including non-refoulement obligations and the prohibition on torture, cruel, inhuman and degrading treatment or punishment. However, this bill seeks to override any future decisions made by the High Court on this point, giving the Immigration Minister extraordinary powers to detain people at sea and send them to another country – regardless of whether we have the country's consent, or whether the country is a signatory to the UN Refugee Convention. "It's not appropriate to send [asylum seekers] to countries that haven't signed the UN Convention." In addition the bill will, if passed, suspend the rules of "natural justice" in a range of circumstances. This significantly reduces the scope for any kind of oversight or scrutiny of the government's actions by the courts, including the High Court. Essentially, this means the High Court will not be able to rule the government's actions invalid, even if they breach Australian laws, international laws or the laws of other countries. This would allow the government to intercept people at sea, keep them there for as long as they wish, and ship them to another country – without any repercussions. 5. Applications for protection will be "fast tracked"
The bill will introduce a new "fast track" application process for people who arrived by boat after August 2012. The fast track process will remove people's access to the Refugee Review Tribunal (RRT) and establish an Immigration Assessment Authority (IAA) in its place. A similar fast track process was struck down by the High Court in the UK, as it carried an "unacceptable risk of unfairness". Earlier this year the Australian High Court ruled Minister Morrison's protection visa cap invalid, finding that the current laws didn't allow the Minister to place a limit on the number of protection visas granted each year. So what's a minister to do? Change the current laws of course. If passed, this bill would overturn the High Court's ruling, allowing the Immigration Minister to suspend processing of protection visas applications and limit the number of people who receive protection. What should I say in my email? A Just Australia have compiled a list of arguments and alternative policies, which can be used as talking points when you contact your senator. a) The re-introduction of the TPVs also comes with a condition that a refugee on a TPV can only ever re-apply for a TPV. b) I believe that after the initial period on a TPV, a person should be able to apply for permanent protection, as history shows that almost 90% of people on TPVs were given permanent protection because the situation in their home countries did not improve and they continued to need protection. c) Without a genuine pathway to permanency, the children released from detention will face the remainder of their childhood and their entire adult life in limbo. They will not be able to travel, to study without paying high fees (as there will be no access to HECS-style loans) or ever be able to reunite with their family members who are in dangerous places. d) The alternative: make permanent protection visas available after the initial TPV. a) The separate review system for certain asylum seekers – and one that removes fair review options – would be unjust, unfair and inefficient. b) I am concerned that the fast track system will mean that already vulnerable people who have faced traima before they arrived here and have been waiting in uncertainty (some for years) for Australia to process their claims for protection will now have to navigate an inflexible system without the support of a migration agent or lawyer, as the Government has removed access to affordable advice. c) I believe that the creation of the Immigration Assessment Authority as a separate review body for fast track applicants is aimed at reducing applicants' access to a fair and independent review of the Immigration Department's assessment of their refugee claim. We already have an existing review body (the Refugee Review Tribunal), so I do not see any reason for the introduction of a separate review system that will not permit asylum seekers a hearing or interview. d) I am concerned that it is inherently unfair for officials of the Immigration Department to decide whether or not a decision of the Department should be reviewed under this arrangement. e) The alternative: people can be assessed under the current system. a) I am worried that by creating its own definition of who is a refugee (and therefore, who gets Australia's protection), Australia is going to upset the international protection system at a time when there are more people being forced from their homes than since World War II. b) The changes to the definition of refugee would create unreasonably high thresholds for accessing protection in Australia and would increase the risk of people with genuine protection needs being returned to danger. c) They will also allow (and, in some cases, require) government officials to remove people from Australia without considering our obligations to not return someone to a place where they face persecution or danger. d) The alternative: maintain the definition of refugee as currently set out in the Migration Act. a) I am troubled that babies born in Australian hospitals would be classified as "unauthorised maritime arrivals" because their parents arrived by sea and sought protection. b) There are approximately 100 Australian-born children who will not be able to seek protection in Australia or be granted citizenship even though they have Australian birth certificates. c) The alternative: permit these babies and their parents to apply for protection here in Australia. a) The proposed change would allow the Immigration Minister power to cap the number of Protection visas granted in any year. b) Protection needs will inevitably vary from year to year due to changing conditions in countries across the world. c) Capping the number of Protection visas would be like capping the number of rescues that surf lifesavers can make at beaches each summer around Australia. d) The cap and resulting delay in the processing of claims of anyone impacted by the cap would leave people in limbo while also undermining the Government's call for speedy processing and resolution of cases. a) The changes to the Maritime Powers Act that give the Immigration Minister extraordinary powers during boat interception operations while also limiting the oversight of the Parliament and the judiciary to know about and examine his actions. b) This amendment would give the Minister power to detain people at sea (including in the seas outside Australia's jurisdiction) and send them to other countries or vessels, even without the permission or knowledge of those countries. c) Parliament will have no say in these actions nor will judicial review of any decisions be permitted, as the Bill says that "the laws of natural justice do not apply". MAKE SURE YOUR FRIENDS KNOW ABOUT THIS! Use the buttons below to share it with them on social media, or simply copy the page link and send it to them. Immigration Minister Scott Morrison is trying to push through what is perhaps the most draconian assault on refugee law we've ever witnessed. Will you write to your Senator and ask them to block this bill?